Not many home owners would know if the shingles on their roof would survive severe impact from a 2-inch steel ball dropping on them or if they would survive extreme weather. Most shingles would have damage on both sides of the shingle from such an impact. The Class 4 Shingles were actually tested by dropping a steel ball onto the shingles. The UL 2218 impact test was developed in conjunction with insurance industry leaders for the highest rating. Would your current roof’s shingles survive the impact? Unless you already have Class 4 impact resistance shingles installed on your home, then the answer is no, they probably wouldn’t. Why is that an important factor to your roof? Please read on. The Class 4 shingles weather the storm with the added impact resistance, these shingles offer a level of added protection that you will want for the life of your roof. These impact-resistant, beautiful shingles have been specially engineered to face some of the worst storms and extreme weather and still look their best. They come in a variety of colors and styles so you will be able to find the right shingles that will showcase your home. What Are The Benefits of Choosing Class 4 Roofing Shingles For My Home? + Homeowners should check with their insurance company to see if they qualify. According to Texas Department of Insurance, to qualify for the credit, roof coverings must be tested by an approved laboratory. Roof coverings that have passed the UL Standard 2218 test are classified as either Class 1, 2, 3, or 4. A Class 4 roof covering receives the highest premium credit. We've Got You Covered in Tarrant County! 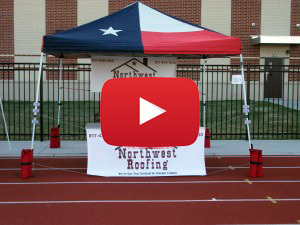 Northwest Roofing serves the communities of Fort Worth, Bedford, Boyd, Decatur, Euless, Grand Prairie, Haltom City, Haslet, Hurst, Keller, Lake Worth, North Richland Hills, Rhome, Richland Hills, Roanoke, Saginaw and Watauga as well as Wise County and Tarrant County.